Timely doesn’t really do justice to the prescience of FIERCE. It’s almost impossible to watch the show, from Red Line productions playing at the Old Fitz, without that gut punch of ‘this is happening’. A woman is a woman is a woman after all and there is a female centre to the story. But this is hardly a narrative play, it is shaped to weave and duck and fly high above the mere telling of her fierceness. Suzie Flack is an AFL star but has a real, unexplained, issue about joining a woman’s team. Never known for missing a chance, the powers that be eventually put her in a men’s team. No gender norming for Suzie: even the same dressing room as the men, with an initial shush on swearing, for her. Familiarity breeds the contempt of these men and whether the bad behaviour that quickly appears is worse or normal we don’t know. And then there’s the WAGs. Lauren Richardson as Suzie is working the big bag as the audience enters and her sweat is real. She does, however, often stand back to size up the swinging menace: not quite planning, not quite fearful. Richardson brings the same puzzlement to Suzie’s interactions in this new world. Often silent, Suzie’s interior world is offered as well as her spoken truths are. Richardson has extremely good vocal technique and in Suzie’s mouth the politics is personal. The play, written by Jane e Thompson, does have its didactic moments but is tightly plotted to have small, and one tour-de-theatre, interludes. A bit like a series of half time shows. 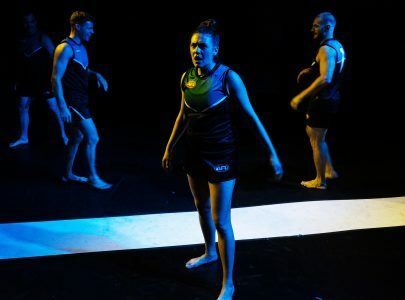 These choreographed sequences, from sport science minutia, through lofting and marking on to krumping and dabbing are one of the highlights of the play. There are, however, some troubling concepts in this show, adversarial professional women, female to female antagonism, some concerning assumptions about the women’s game and a sexuality sub-plot which doesn’t gell with narrative. Director Janine Watson has guided her cast into an un-apologetic performance and the work of this fine ensemble is excellent. Any temptation to soften the repugnancy of some of these men is avoided as the male cast are fearfully horrible in places … it is fearless and fierce performance from these actors. 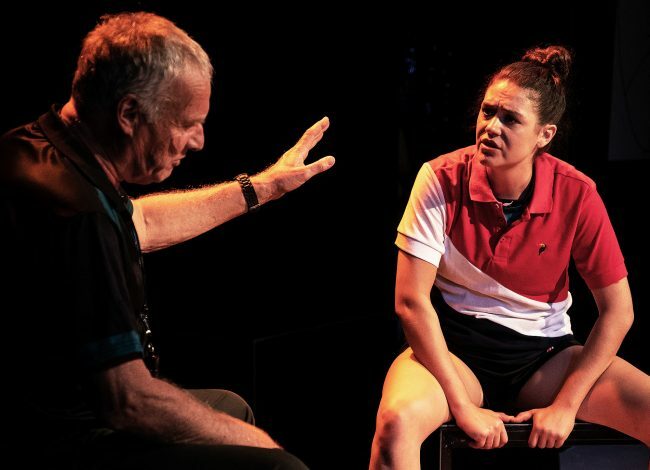 ( Zelman Cressy –Gladwin, Andrew Shaw and Felix Johnson) Martin Jacobs touches the heart as Suzie’s twilight father, Chantelle Jamieson is affecting and brittle as one of the WAGs and Stacy Duckworth is also good in support. The setting brings home the white stripe of a player’s field which is also represented by Suzie’s shirt. (Melanie Liertz: set and costume design). Reflected in the back wall is a cat mascot scratch across the sheds’ mirrors and several benches serve multiple purposes. The lighting (Kelsey Lee) is chosen for soft counterpointed beauty with muted orange and lavenders and aqua to warm the blackness of the walls and the audio design is stellar. 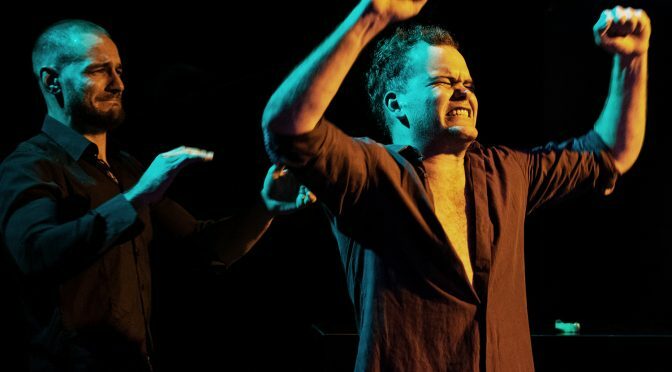 Ben Pierpoint has used familiar music and added sound effects which deepen the audience’s immersion in Suzie’s world. There is a sequence of vile tweets projected into the space and Pierpoint chooses a drip drip behind, wearing resilience down. The betrayal, when it comes, has the distant clunk of gym apparatus and long desperate chords. FIERCE does get you in but not in the angry, confronting way you might expect. There’s an abundance of laughs, some thoughtfully exploited meta themes and above all the sadness of contemporary relevance. FIERCE continues at the Old Fitz Theatre until April 13 and you can read an interview with Lauren Richardson here.